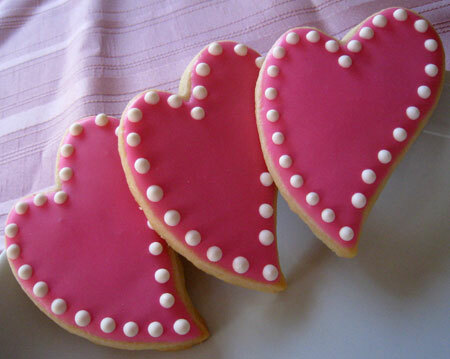 I have a feeling I’ll be making several batches of these cookies over the weekend. Aren’t they cute? I created the effect by icing the cookies with red and blue royal icing and then immediately piping white royal icing over the wet first layer. 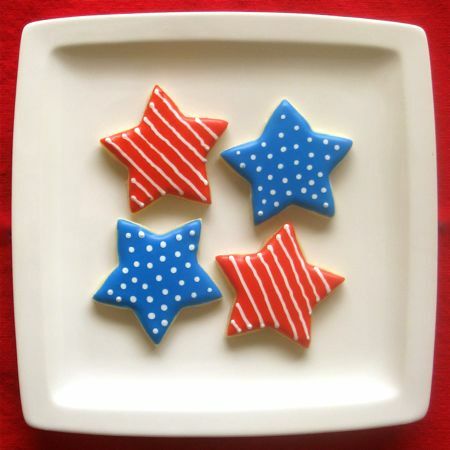 What kinds of goodies are YOU making for the Fourth of July? Aren’t they cute? 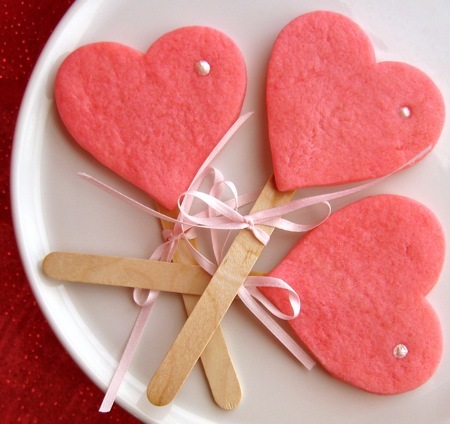 I just base-iced the cookies in one color, used a spoon to swirl two other colors of icing on top, and then dragged a toothpick from the center to the edges. 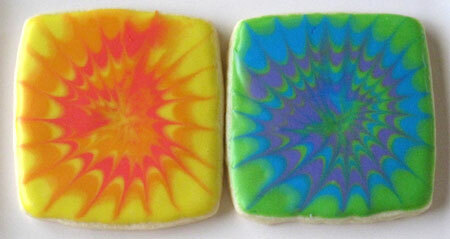 Like real tie-dye, they all end up a bit different. It’s cookie time again, y’all. I’ve baked and iced well over 500 sugar cookies in the month of September, which even I find hard to believe. I wanted to share my latest two batches: hearts for my parents’ 37th wedding anniversary (congrats, Mom and Dad!) 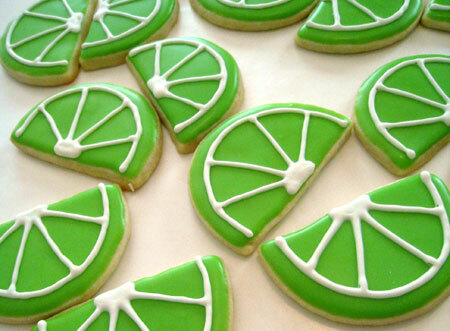 and lime wedges for the tequila party I’ll be attending in New Mexico this weekend. Oh, who am I kidding? I love any excuse to make sugar cookies. This was by far the largest number I had ever cranked out for a single event, though, and it was a project. At least I had Paige, Katie, and Catherine to help with the base icing… Thanks, ladies! I think they turned out pretty cute. Hopefully, they’re the perfect accent for the Sisterhood Day parties taking place tomorrow night. Good luck, Deltas! 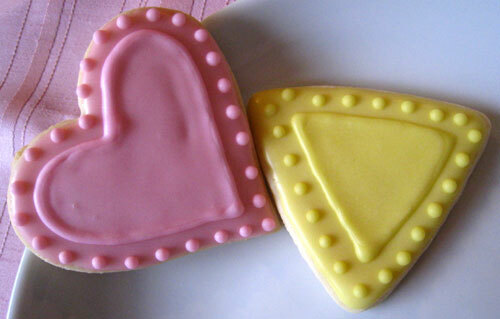 Man, am I *ever* getting good use out of the triangle cookie cutter I picked up at Cake Crafts a few months ago. We went up to Breckenridge last weekend for a ski trip that was half Dr. O’s birthday celebration and half a college reunion for Dr. O’s little brother. I figured a houseful of guys would enjoy a sweet treat or two, so I whipped up a batch of Chocolate Caramel Oatmeal Chews and a batch of sugar cookies shaped like little snow-capped mountains. Aren’t they adorable? But I just had to post a picture of the sugar cookies I made for a White Elephant party I attended last night. Aren’t they cute? 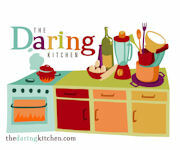 Click here for my original sugar cookie post (recipe included!) if you’d like to give them a try.